The spring semester has started off strong for the brothers of Sigma Nu. The chapter is thriving thanks to the brothers’ academic achievements and philanthropic work, and this past recruitment period went extremely well. More than 300 potential members came through the house during rush, so Sigma Nu was able to add 25 new members to the chapter and are excited about the potential of these new recruits. The brothers have also been doing a great job in the classroom. This year, they earned a combined GPA of 3.16 and had 34 members make the Dean’s List. Additionally, last semester, the chapter GPA increased to a 3.24. Although the brothers have already been successful academically, they certainly aren’t stopping there. They have decided to bump the minimum required GPA from a 2.0 to a 2.4. They feel that this change will encourage members to work harder in the classroom. In addition to their excellence in academics, the brothers of Sigma Nu have also been working hard to give back to the community. They have participated in more than five philanthropies this semester alone, including the Pirates of Lanier Poker Run. 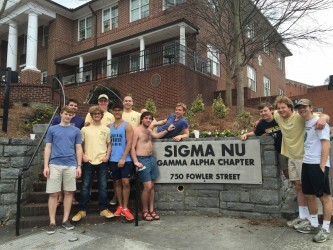 With the help of other organizations, this philanthropy was able to raise $400,000, and the Sigma Nu brothers donated 240 total hours of their time in order to help make that possible. The brothers also participated in Relay for Life, St. Baldricks, Charles Harris Leukemia Run, and their annual steeplechase. In the next few months, the brothers would like to encourage alumni to come to the house and participate in the alumni baseball tailgate and alumni mock interviews. There is a lot to look forward to if you are a member of Sigma Nu, and the brothers hope to continue to be successful in the second half of the spring semester.